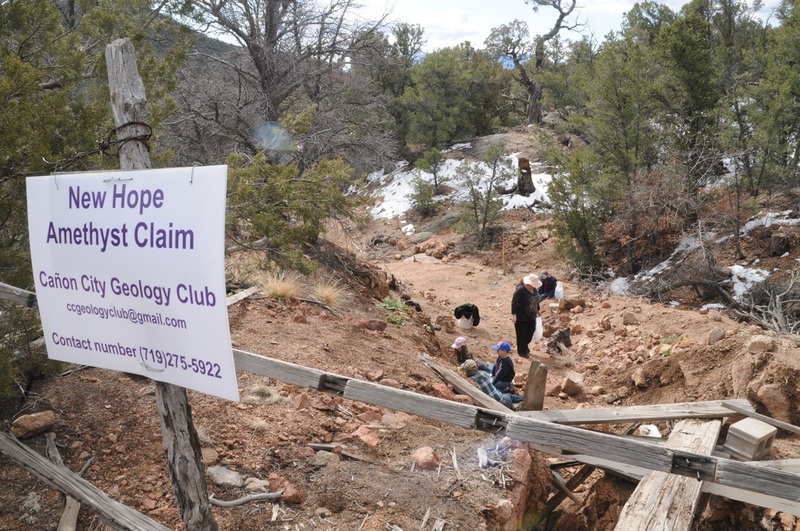 CCGC has a claim on an amethyst mine near Cañon City. Several field trips are scheduled each year for members to visit the claim. Click to see field trip information for NHAC field trips. Field Trip in the trench. 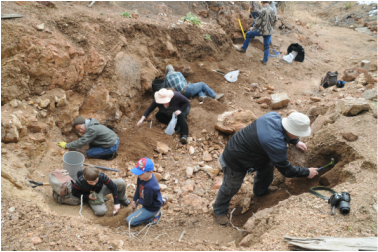 The early explorations of the area were from those seeking gold, copper, silver, lead and zinc of which several minable occurrences were found in this part of Fremont County. Sometime before 1900 indications of copper were discovered on a ridge south and west of the New Hope Claim. A shaft was sank in the recrystalized carbonatite dike about four feet by eight feet to a depth of about eighty feet. Some amethyst, malachite and clear calcite crystals evidence that the discoverers may have found some gold and silver with the copper. Also the volume of tailings is not consistent with the volume of rock removed so off site processing is suggested. Several other small pits and prospects are located on this “vein” and latter operations used heavy equipment. Around 1904 to 1906 J.P. Endicott began exploring for the source of the amethyst found in this area and after digging several pits and prospects located the heavy amethyst impregnated zone of the New Hope “vein” on the New Hope Gully and sank a shaft that reached some forty feet in depth by 1960. Several other pits and prospects were excavated between the 1928 and 1970. The power excavations were likely from exploration for uranium in the 1950’s. The only disturbances on the New Hope Claim from this period are the New Hope Shaft, a pit on the north east dike just north and west of the road junction, a trench and face where the New Hope dike opens on the west side of the bed of Amethyst Creek (ephemeral), a cut on the carbonatite dike between the New Hope Gulch and the east flowing creek bed before emerging again in the afore mentioned trench and face. A very shallow prospect is atop the top of the ridge that divides the Cottonwood Creek basin from the Tallahassee Creek Basin, near the old northwest corner of the claim. When I first visited the New Hope there was a barb wire fence around the shaft ‘house’ which consisted of a ‘cedar’ and pine log frame with a sloping to the north board and tarpaper roof with a wood door in its center with a hasp and lock. That was around 1957. By the early 1970’s the door and cover were removed and only three or four logs remained of the frame and most of the fence was down. In 1990 the club placed two wood framed garage doors sheathed in corrugated/galvanized steel across the hole to keep children and cattle out. By this time the pit/trench north of the shaft and across the road was forty to fifty feet long and twelve feet wide and about fifteen feet deep. Between 1956 and the early 1970’s another pit was dug across the road north of the New Hope shaft and began the trench along the carbonatite dike. After covering the shaft the south end of the trench was filled with tailings and extra tailings filled the advancing gully to the east (just north of the present ‘discovery post’). 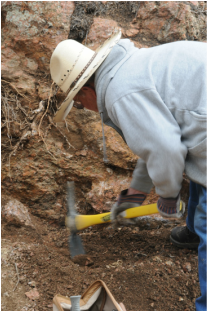 Some soil and overburden were stacked in a ridge west and north of the trench to expose more of the amethyst vein in the carbonatite and for recovery. Then we began to remove tailings along the New Hope gully and to reduce the approach to the shaft. 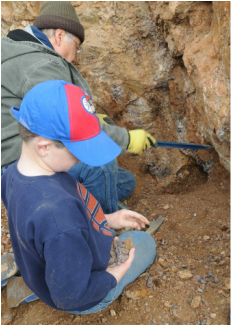 Three years ago a discovery of well-formed but small crystals was found in the north east dike atop the basin divide ridge. This has become another trench about two to three and a half feet wide and maybe four feet deep. The vein is less that six inches wide and often less than three inches. The color of the New Hope amethyst ranges from a smoky quartz to rich purple to translucent clear quartz amethyst. The purple color of amethyst has been attributed to iron and sometimes manganese . The color is caused by radiation stripping the iron ion to the Fe(3++) state while the quartz is crystalizing, and can be changed to citrine (yellow) by heating the stone(s). In the case of the New Hope amethyst, veins of quartz were injected in to the carbonatite dikes well after the volcanics, which were their origin, had gone through three phases of their development. Some rare earth elements (REE), thorium, and uranium may still be found in some of these rocks and most certainly were present in the silica rich solutions, which deposited these crystals. Early in their deposition aluminum must have been greatly richer as the crystals start out as smoky quartz, which when irradiated gives a smoky color. The carbonatites were injected about the same time the other alkali deposits were injected into the ancient rocks following an awesome explosion, or a series of explosions which left many breccia zones to be injected by the alkalic solutions and magmas of these volcanos into the Precambrian granite, gneiss, and schist. This was in the late Precambrian or early-Cambrian. A zircon recovered from a syenite gave a date of about 565 million years ago. So the silica must have been injected into these veins shortly after the dikes developed and before the mass was subducted to a strong metamorphic zone. There are three main types of original calcite in the carbonatite dikes from the “burnt rock” dark brick-red carbonatite. Much is very dark ferroan calcite mixed with feldspar fragments, chlorite, and some dolomite fragments. Some is a frosty fine-grained “limestone” and then recrystallized material with pink to green zones, white rhombs, and clear eroded crystals. These are mixed with barite, some chalcopyrite, and many other less apparent minerals. Latter (recent) erosion and precipitation left dusty crusts of efflorescence coat many of these specimens.